Among all the epic action on show, Infinity War will also be a film with plenty of character beats as these iconic superheroes finally come together. The awe-inspiring trailer for Avengers: Infinity War has been released, and it’s already set the internet on fire. The hype is understandable though, because Infinity War truly feels like something special. Its arrival in theaters will mark the tenth anniversary of the Marvel Cinematic Universe, and it will culminate a story that was first hinted at during the credits of The Avengers back in 2012. And of course, among all the epic action on show, Infinity War will also be a film with plenty of character beats as these iconic superheroes finally come together. In Captain America: Civil War, the MCU — or rather the Avengers — were torn apart by the Sokovia Accords, which had been manipulated by the vengeful Helmut Zemo (Daniel Brühl). The conflict escalated even further between Iron Man (Robert Downey Jr.), Captain America’s (Chris Evans) and his friend Bucky Barnes (Sebastian Stan), when Stark discovers that Barnes had killed his parents during his days as the Winter Soldier, and that Steve had deliberately hid the information from him. Included with the letter was a small flip phone, which Tony was last seen gazing at with a wryly amused look on his face. So, how is that significant to Infinity War? Well, let’s look back at that new trailer. Out of the plethora of cool moments, there is one showing Tony, Doctor Strange (Benedict Cumberbatch), Wong (Benedict Wong) and Bruce Banner (Mark Ruffalo) standing inside the Sanctum Sanctorum. Outwardly, there’s nothing hugely significant about it, except that it’s awesome to see these characters finally meet. But there, hidden in Tony’s right hand, is that same flip phone! And most significantly of all, Stark appears to be closing it, just before he worriedly checks outside the building’s front door. Therefore, it’s safe to assume that at this point in the film, Tony has just called Steve. Obviously, this isn’t wholly surprising news. The way in which Civil War ended certainly emphasized the possibility of Captain America/Iron Man reconciliation at some point down the line. But heck, it’s still a thrilling detail to notice. How are these one-time friends going to react to each other after years apart? And in what context is Tony calling Steve? Is he simply tired of the rift between them, or has Iron Man been forced to call Cap for back up? My guess is that it’ll be the latter, since the glimpse of the phone occurs in what looks like a busy time for Tony. Hulk seems to have crashed through the Sanctum’s roof, which will probably draw Stark and Strange together for the first time. Plus, we also have that shot of a huge, floating mechanical ring setting up shop (and setting off Peter Parker‘s Spider Sense) in New York, which suggests that Tony has decided to call Steve in reaction to the impending disaster. Indeed, Stark’s evident concern about what’s happening beyond the Sanctum’s walls implies that Thanos (Josh Brolin) has already begun his assault upon the city at this point. 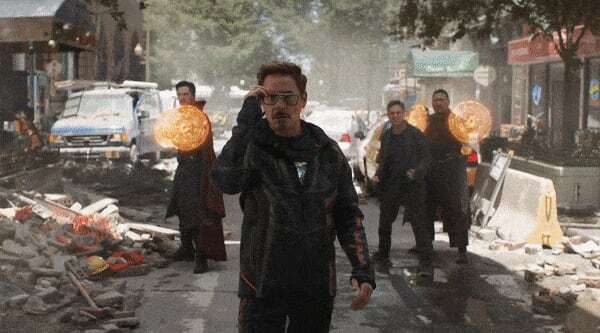 Additionally, there’s no indication in the trailer that Iron Man and his team — consisting of Spider-Man (Tom Holland) and Doctor Strange — convenes with Cap and co. before that huge battle on the plains of Wakanda. Then again, Marvel’s marketing deceived us with Thor’s (Chris Hemsworth) and his missing eye in the teaser footage for Thor Ragnarok, so we can’t take these trailers as gospel. Nevertheless, the reconciliation of Tony Stark and Steve Rogers is set to be a hugely pivotal moment in Avengers: Infinity War. Indeed, these founding Avengers need to make peace with each other to lead their team of superheroes to victory. We here at Movie Pilot can’t help but think it’s going to be a bittersweet affair, since the deaths of Captain America and Iron Man are already looking likely. It’s probably best to take a pack of tissues with you when Infinity War is released. After all, the Russo Brother’s have nailed every emotional beat that’s been thrown their way thus far, so it seems certain that the reunion of Captain America and Iron Man will be a truly poignant moment for us to witness.